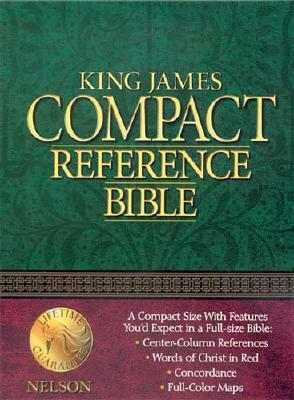 This handy, take-it-with-you edition of the timeless King James Version contains more features than you'd ever expect in a compact Bible Helpful center-column references expand your understanding of every verse. A 112-page concordance and full-color maps enrich your reading of Scripture by providing additional insight on important words and places. Its trim shape and size make the Compact Reference Bible perfect for bedside reading or travel and a great gift for people on the go. Description: Black bonded leather. Gilded gold page edges. 60,000 center column references. Full color study maps. Words of Christ in red. Nelson 345. As new. In original gift box. Full refund if not satisfied.